This article is about artwork damaged and destroyed at the former World Trade Center. For artwork at the rebuilt World Trade Center, see Artwork in the World Trade Center. An estimated $110 million of art was lost in the September 11 attacks: $100 million in private art and $10 million in public art. The attacks were said to be "the biggest single disaster ever to affect the [art] industry". The Port Authority held an estimated 100 pieces of art work at the World Trade Center Complex, in addition to the seven public works of art that had been created for the World Trade Center, all of which were destroyed or severely damaged. An estimated $10 million worth of public art was lost due to the collapse of the World Trade Center. Ideogram, The World Trade Center Tapestry, and Sky Gate, New York were never recovered from the rubble and are presumed destroyed. Cloud Fortress survived the attack and collapse of the buildings, but was severely damaged and subsequently cleared by rescue workers in the days after the attacks. Bent Propeller was partially recovered from the rubble. Only a small piece of the 1993 bombing memorial fountain was recovered. The Sphere was damaged in the attacks, but was refurbished and put on display as a memorial. 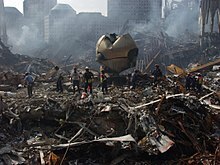 The World Trade Center alone held more than 430 tenants at the time of the attacks. In addition to the decorative art that each office contained, some firms held large corporate art collections. Three companies held major corporate art collections in the World Trade Center: Fred Alger, Cantor Fitzgerald, and Bank of America. Aside from these three, all other companies in the World trade center kept their artwork in other locations. In addition to losing the most lives in the attack, Cantor Fitzgerald lost the most artwork. Their offices on the 105th floor of the North Tower housed a gallery called the “Museum in the Sky” which held an estimated 300 casts of Rodin sculptures. Some of the Rodin works were recovered a quarter mile away from Ground Zero, including a bust from The Burghers of Calais, two of the three figures from The Three Shades, and a cast of The Thinker. After being recovered, The Thinker cast went missing, possibly due to theft. The collection of Citigroup, whose office was in World Trade Center Building 7, contained 1113 works of art which were all lost on September 11, 2001, according to Suzanne F. W. Lemakis who was the Citigroup Art Curator at the time of the attacks. The Citigroup collection at the World Trade Center consisted of about 75% prints, many of which were mass-produced and were replaceable. Also lost were English and American antique furniture, and Asian porcelains. According to Lemakis, the most expensive painting in Citigroup’s collection was a large mural depicting Wall Street, painted by an unknown designer. Also located in the North Tower, this firm lost a collection of photographs by photographers including Cindy Sherman and Hiroshi Sugimoto. Bank of America’s office in the World Trade Center lost over 100 works of art by contemporary artists. At the time of the attack, the firm had only five lithographs in its Trade Center office, keeping most of its corporate art collection of over 17,000 works of art at its offices two blocks from the World Trade Center. The Lower Manhattan Cultural Council had its offices in Building 5 of the World Trade Center, and two studios on the 91st and 92nd floors of The North Tower. The Council hosted an artist-in-residency program, called World Views, which hosted 15 artists from around the globe and was supposed to run from May–November 2001. The 15 artists worked in the studios in the North Tower. Nearly all of their artwork was lost in the attack on and subsequent collapse of the towers. At least one of the artists, Jamaican-born sculptor Michael Richards, also died in the attacks. Richards had worked through the night in the towers on an unfinished sculpture, a memorial piece dedicated to the Tuskegee Airmen, which portrayed a pilot riding a burning meteor. The council also lost all of its archives that had been in their offices in Building 5. Twenty-four works from the art collections of the Army, Navy, Air Force, and Marine Corps were destroyed at The Pentagon by the attack. Some works from The Pentagon's library were also damaged, but the majority were ultimately restored. Much of the art was not insured for its full value. ^ a b c d e f g "A museum in the sky". The Economist. 11 October 2001. Archived from the original on 2017-11-13. Retrieved 1 December 2017. ^ a b c "Lost Art Hundreds of Works Were Destroyed in the Trade Center Attack". National Public Radio. 16 October 2001. Retrieved 1 December 2017. ^ a b "'Up to' $100m art lost in attacks". BBC. 5 October 2001. Archived from the original on 2017-11-22. Retrieved 1 December 2017. ^ Wenegrat, Saul (28 February 2002). "Public Art at the World Trade Center". ifar.org. International Foundation for Art Research. Retrieved 1 December 2017. ^ "List of World Trade Center tenants". cnn.com. CNN. Archived from the original on 2017-10-02. Retrieved 1 December 2017. ^ a b Barry, Dan; Rashbaum, William K. (20 May 2002). "Born of Hell, Lost After Inferno; Rodin Work From Trade Center Survived, and Vanished". New York Times. New York City. Archived from the original on 2017-12-04. Retrieved 1 December 2017. ^ Lemakis, Suzanne F.W. (28 February 2002). "The Art Lost by Citigroup on 9/11". ifar.org. International Foundation for Art Research. Archived from the original on 2016-09-17. Retrieved 1 December 2017. ^ a b Lemakis, Suzanne F.W. (28 February 2002). "The Art Lost by Citigroup on 9/11". ifar.org. International Foundation for Art Research. Archived from the original on 2013-06-30. Retrieved 1 December 2017. ^ a b Cotter, Holland (3 December 2001). "ART REVIEW; The Studios Were Lost, But the Artists Get Their Day". New York Times. New York City. Archived from the original on 2018-01-28. Retrieved 28 January 2018. ^ Bridge, Sarah; Kazi, Stastna (21 August 2011). "9/11 anniversary: What was lost in the damage". CBC. Archived from the original on 2018-01-19. Retrieved 28 January 2018.